New Delhi, Oct 3 (IANS) The Human Resource Development (HRD) Ministry on Tuesday launched a diploma course in Elementary Education to train teachers across the country in teaching students up to Class VIII. The ministry intends to train all such teachers with minimum qualifications by 2019, as per the amended Right of Children to Free and Compulsory Education (Amendment) Act, 2017. The course, having a duration of one year and six months, has been designed with the help of National Institute of Open Learning (NIOS) and so far about 15,00,000 teachers from both private and government schools have registered for it, said NIOS Chairman Chandra Bhushan Sharma at the launch here. The lectures for the course have been uploaded on the “Swayam” platform — a repository of Massive Open Online Courses — of the ministry and will also be telecast on Doordarshan’s education channels which can be availed by subscribing to its DTH service. A mobile app was also launched on the occasion through which teachers can get access to the lectures. 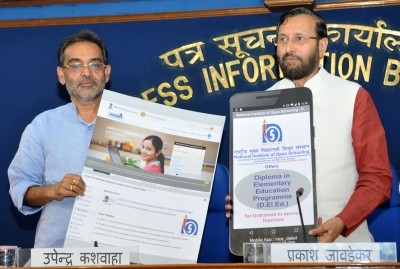 Addressing those present at the event, HRD Minister Prakash Javadekar said this would be the last time that the teachers were being given this chance to be certified teachers and no extension would be given beyond March 31, 2019, when the course gets over. According to the RTE Act, 2010, all 11 lakh such teachers were to be trained by 2015. “But we saw that in six years’ time from the passing of the Act we were able to train only four lakh teachers… Then we brought the amendment which was passed with unanimity in both the Houses. It’s children’s right to be taught by trained teachers,” Javadekar said. About 2,82,000 teachers have registered for the course from Bihar — the highest — while West Bengal has recorded registration by about 1.3 lakh teachers. “This is the largest such training registration drive ever in the world,” the minister added.